Last week, Nebraska hosted one of the biggest recruiting weekends in school history when it had double-digit official visitors in town for the Wisconsin game. While the game didn’t go as hoped, the visitors and their families came away impressed. Now it’s Ohio State week and while it’s another top-10 opponent, the visitor list is not as robust as it was last week. However, that doesn’t mean that there are not key visitors that will be here. 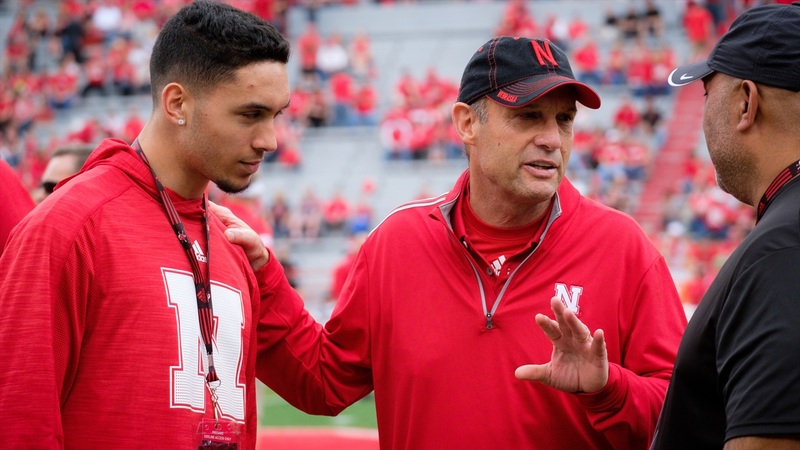 High 4-star athlete Talanoa Hufanga‍ will be in Lincoln for an official visit. It’s his second trip to Lincoln in less than a year as he made the trip for the spring game. Hufanga is likely the No. 2 uncommitted target on Nebraska’s big board. There will also be a pair of 2019 unofficial visitors that are must-gets for next year’s class. Four-star quarterback Max Duggan‍ from Council Bluffs will be back on campus. I'm going to see Duggan play tonight, so expect a full report soon. So, will 4-star defensive end/outside linebacker Marcus Hicks‍ from Kansas. >>Nebraska made the top 5 for a week three, 4-star visitor. >>New offers are flying out for Nebraska as they evaluate senior film. One went out to a fast-rising IMG defensive back. >>I caught up with Nebraska’s latest offensive line offer out of a powerhouse program in California. >>Nebraska had another new offer go out yesterday to 3-star wide receiver/linebacker Maureese Wren‍. The versatile athlete has some good offers including Colorado, Washington and Missouri. I spoke with him briefly and he told me that he and Nebraska had only been talking for about a day and they moved quickly on the offer. Trent Bray is recruiting him as a linebacker and he is in the process of setting up a visit. >>I like what I see on tape of the players Nebraska has been offering after watching senior film. I just mentioned Wren, who I think will grow into a dynamic OLB in time with his frame (6-3, 220). Defensive back Andre Cisco‍ loves to hit and I’m sure that helped his cause for an offer given what we’ve seen in the secondary this season and Jarrett Patterson‍ has a tremendous frame and high school pedigree. >>Another note on this week’s big visitor, Hufanga. Nebraska has a real shot to improve its position with him this weekend. Both of his parents will be on the visit and he really enjoyed his previous time in Lincoln and is excited to show his parents what Lincoln is about. Oregon has been the favorite for a long time but both Nebraska and USC are emerging as real options for the instant-impact player. >>There will continue to be speculation for the time being around Radley-Hiles, Moore, Goodrich and Williams remaining in this class until things settle down. Hiring an Athletic Director as soon as next week will make a difference for big-picture vision. However, as long as Nebraska continues to be uneven at best on the field those guys will be recruited by other schools and players. Even if Nebraska was 4-2 or 5-1, Alabama would still be going to see Moore play, as it did last week. Remember the battle to keep Radley-Hiles in the fold started before the season because he’s a tremendous prospect not because of the results on the field. The struggles on the field plus the uncertainty with the coach those players committed to and them being highly-rated is the perfect storm for a turbulent finish to the class.